One of the basic things we learn at school, and probably don’t think about again until we start to dive is Boyle’s Law – Simply put – As pressure doubles, volume halves (given constant temperature and some other stuff). This is also something that is taught as part of any freediving course (or scuba), as it helps us understand the physiology, and the dangers, of gas expansion or compression in the context of diving. 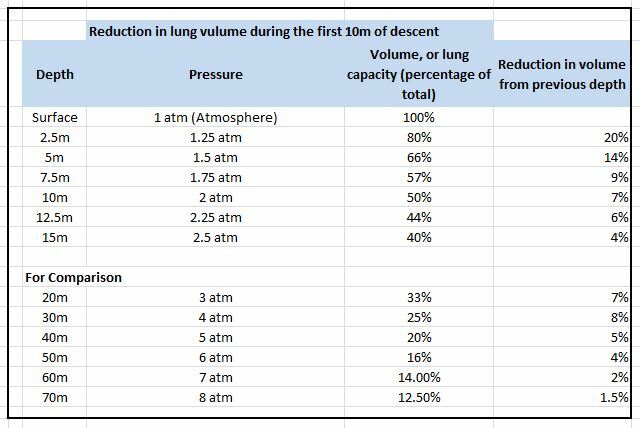 So any freediver will have seen the table that illustrates that at 10m down the pressure has increased from 1 atmosphere to two and the volume in our lungs has halved. And when we get to 20m despite this being double the depth the pressure is only 3 atmospheres so it isn’t until you get to 30m where pressure will be 4 atmospheres, (double what it was at 10m) that the volume will be halved again, 1/4 of what it was at the surface. Whilst this is a great help in illustrating the principle, the reality is the when we start diving we aren’t thinking in terms of 20 or 30m, the difficulties we need to overcome are all in the first 10m, and srangely there isn’t really a table anywhere on the internet that illustrates what happens in this band, until now! I used an online Boyle’s Law calculator to work out what happens to our lung volume in the first 15m, and illustrate it, with a comparison to the deeper changes, for me and all to see forever more. Let’s hope it is correct. The reduction for each stage shown in the right hand column illustrate how the rate of change drops rapidly with depth. From this table we can make a few observations…. If you duck dive and put your lungs where your fins were (say 2.5m), the air in your lungs has already reduced by 20% and you have experienced the quickest build up of pressure than at any other time in your dive. We all know that by diving to 10m our lung capacity is halved, but of that half, very little is lost between 7.5m and 10m, most of it is before that, (7% between 7.5 and 10m, compared with 20% between the surface and 2.5m. You only have to get down to the 12.5 – 15m zone and the differences are relatively small. The volume of air lost between the surface and 2.5m is roughly the same as that which is lost between 20m and 70m. I have found that with the practice I have had, equalising comes much more easily over these first couple of metres than it used to. Without thinking I do a frenzel manouvre as I turn to dive which seems to free things up in the first metre, then grab my nose after I have started to straighten out and drop, this means after my fins have submerged and I have made the first kick, which puts me down at 3m, there isn’t a build up of pressure. This entry was posted in Equalisation, freediving and tagged boyle's law, equalisation, equalization, Freediving, frenzel on July 27, 2015 by mybluejourneyeditor.